Please note that this widget area requires the SEO Slider plugin to be installed and activated. 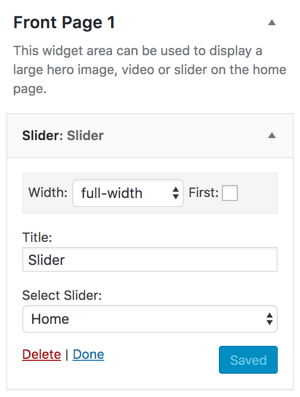 For more information on how to use the SEO Slider plugin please refer to the Creating a Slider article. The Front Page 1 widget area contains 1 Slider widget. The slider widget displays a list of available sliders. To create a new slider, navigate to Slider → Add New. After you have created a new slider it will be available from the dropdown list in the widget.